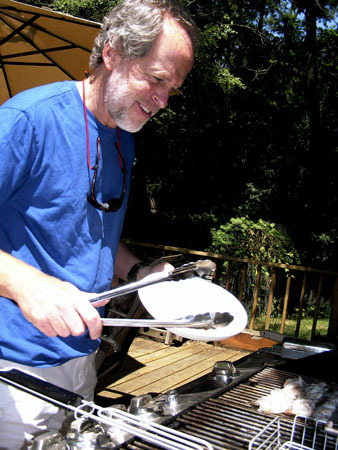 Bruddah PF drove over for a BBQ at Jeanne’s house and we put him to work cooking up some seafood kabobs. A beautiful sunny day, plenty of food, good company, lots of free consulting between each other on tech, photo and video topics. I was told by PF to make a pilgrimage to B&H Photo-Video while in New York even if I don’t buy anything and just marvel of the spectacle like a visit to Grand Canyon. I owe it to myself to visit as a photographer. 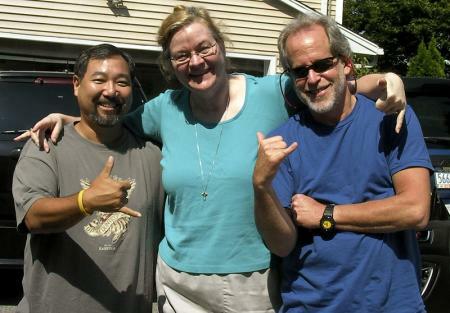 Tita and da Bruddahs say aloha. And for the record, I tested a Tom Tom GPS unit to get to Jeanne’s house, it failed and left us at least a block off and on the wrong part of the road. PF used a Garmin and it got him right to the house. So folks, although the Tom Tom got me all around Florida for accuracy you might want to get the Garmin.